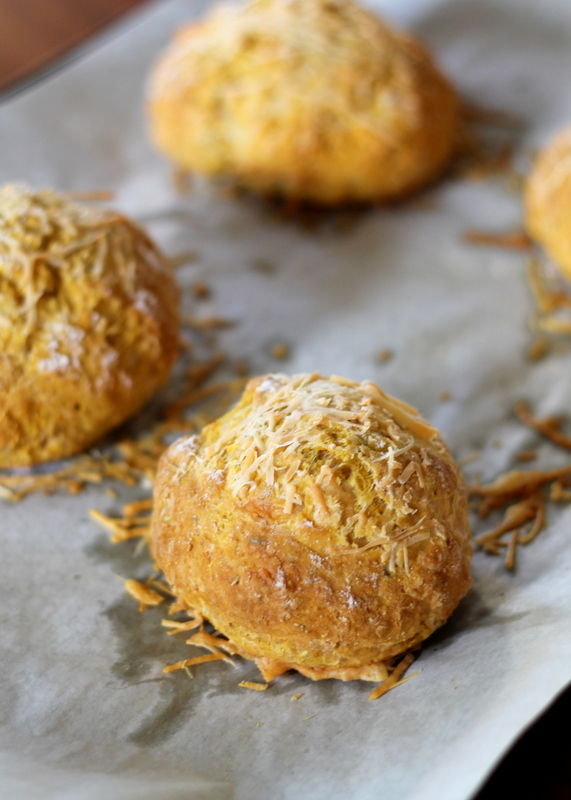 These easy, no-yeast Pumpkin Parmesan Bread Rolls are filled with herbs and topped with cheese. These are the perfect soup companion! How in the world is it almost Thanksgiving? Don’t get me wrong, I absolutely adore this time of year and all the lovely holiday baking that comes along with it, but I swear – last holiday season does not seem to be a year off already. It’s insanity! Though, because it’s pumpkin season, I’m taking it in stride and making as many pumpkin-y things as possible before it’s back to summer fruits once more. This time of year, pumpkin-filled things are everywhere…but usually they’re sweet. Pumpkin breads, pumpkin cakes, pumpkin cinnamon rolls, all are delicious, and I love them all. But I also love pumpkin paired with cheese, and with spices and herbs, and with all the other delicious things that it goes so well with that I feel like too many people forget about. These rolls were a random experiment that went so right. 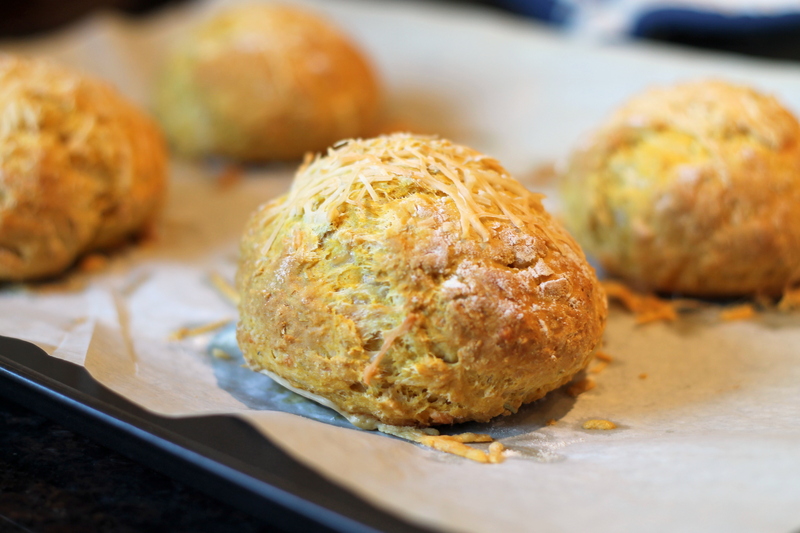 Any kind of roll that doesn’t use yeast and still tastes amazing is a good thing in my book, and flavored with pumpkin, filled with savory herbs, and topped with cheese just makes all of that even better. These rolls aren’t your traditional bread rolls, they have a slightly different crust texture that isn’t as chewy as a regular roll, but these are still AMAZING. As soon as they came out of the oven, I grabbed one to taste. I planned on just a taste…but in seconds, butter was out, and the roll was slathered in it and devoured before anyone could stop me. If you make these, I highly suggest you do the same thing. It’s a magical experience. In fact, I really wish I had one of these to devour right now! The batch only makes 4, but it’s easily double, or tripled, or multiplied by however many you need! They’d be perfect for Thanksgiving or just any weeknight dinner. They’re so easy to stir together and throw in the oven you can make them whenever you want. Enjoy! Preheat the oven to 350°F. Lightly grease a medium sized baking pan or sheet. In a big bowl, combine grated pumpkin, flour, baking powder, salt, rosemary and 1/4 cup of Parmesan cheese. Add the eggs and milk and mix with a wodden spoon. The dough will be quite wet and somewhat sticky. If necessary, add some more flour so you can shape the rolls. Divide the dough into 4 equal portions and transfer each to the baking pan. Lightly flour your hands and shape the dough portions into 4 round balls. Sprinkle them with some flour and the rest of Parmesan cheese. Bake for 25-30 minutes or until lightly browned. Allow the rolls to cool on the pan for 5 minutes and then transfer to a cooling rack to cool until warm or room temperature. Serve and enjoy! These rolls can last about 1 week in a sealed container at room temperature, or 1½ weeks in the refrigerator. Although I haven't tried it, I assume they will freeze well for up to 2 months. To warm the rolls, place in a 350 degree F oven for 10 minutes, or microwave for 30 seconds. These look AMAZING! Definitely going to try!! Yummy pumpkin rolls without yeast? LOVE. Wow, based on the pics of that fluffy roll, it’s hard to beleive you didn’t use yeast…awesome!!! I’ll have to give these a try. I love bread but rarely have time for the yeasty kind. Oh, these look so good! I love that you used pumpkin to make more of a savory recipe. These rolls, seriously though, with all that cheese and butter–I would definitely take these over a pumpkin pie! These look so good, and easy! I’m definitely going to consider making these for Thanksgiving. On another note, I met you a couple years ago at the Food Blogger’s Bake Sale in SD (back when I had a different and primarily baking blog) and just wanted to let you know it’s been amazing to watch your blog grow! Oh wow, these rolls look and sound SO fantastic. Just perfect for Thanksgiving, or really any fall meal! I’m going to vote for you right now, your pb rolls deserve to win! Ok so voted!! Those look so amazing! And these rolls? OMG. I saw them on Instagram the other day and almost cried. 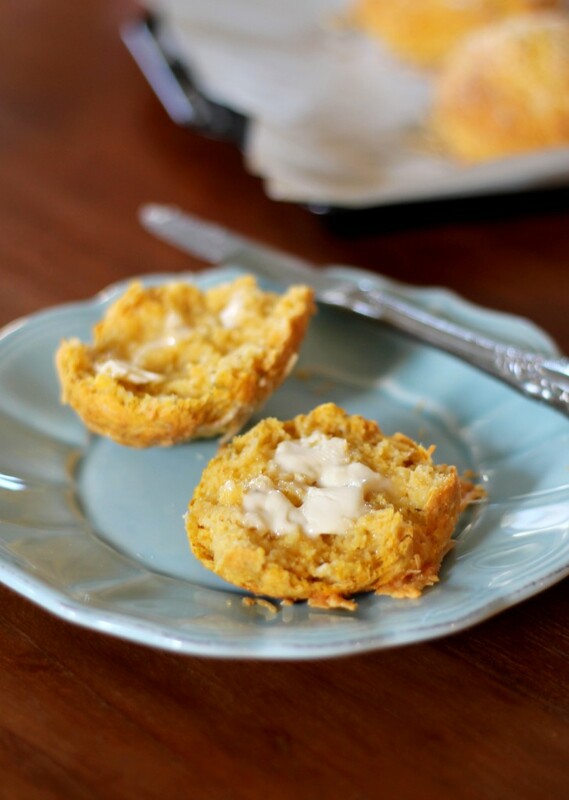 I’m really into savory pumpkin recipes right now and am always trying to find easy bread recipes that are fool proof, so I love love love these! These rolls look amazingly good! I’ve never made pumpkin dough before, but it sounds like a total winner. Love the flavor combination going on! Love the pumpkin-parmesan combo! I swear, I’ve been such a grump about seeing pumpkin EVERYTHING since, oh, August, but I love stuff like this–pumpkin works so well in savory dishes! Just lovely! I love savory twists on pumpkin, and now that you’ve added some of my favorite herbs and cheese?? I could take down a whole basket! I made these rolls last night with our left over baked hubbard squash. Woah! They were delish!! This recipe is definitely a keeper, thanks so much! Pumpkin-parmesan combo is very intriguing! Thanks for the post! These are totally up my alley! I love savory pumpkin dishes, and I totally agree that they get forgotten about. And with parmesan cheese? Yes, please. Wow, these would be awesome for sandwiches too, not just as a side! Pumpkin + parm? Sign me up!